Two young Mormons and a trusty horse are set to arrive in Boston. No, it isn’t the beginning of a joke; it’s the lineup of Broadway in Boston’s 2012-2013 season! The 2011 Tony winners for Best Musical and Play, The Book of Mormon and War Horse, will play to Beantown audiences next season. The lineup, which was announced on March 5, will also include Memphis, Sister Act, Tuck Everlasting, Jersey Boys, Wicked and Mary Poppins. The Book of Mormon, winner of nine Tony Awards, will open at the Boston Opera House on April 9, 2013 and close on April 28. Written by South Park creators Trey Parker and Matt Stone and Avenue Q co-creator Robert Lopez, The Book of Mormon follows two young Mormon missionaries sent to Uganada, who soon discover their training did not quite prepare them for the world outside of Salt Lake City. War Horse, winner of five Tony Awards, will run from October 10, 2012 through October 21. Using extraordinary puppets, War Horse tells the story of young Albert and his beloved horse, Joey, who is sold to the cavalry and shipped to France at the outbreak of World War I. Albert, unable to forget Joey and still not old enough to enlist, embarks on a mission to find him and bring him home. Set in the turbulent south in the 1950s, Memphis is the rollicking story of Huey Calhoun, a white radio DJ whose love of good music transcends race lines and airwaves. 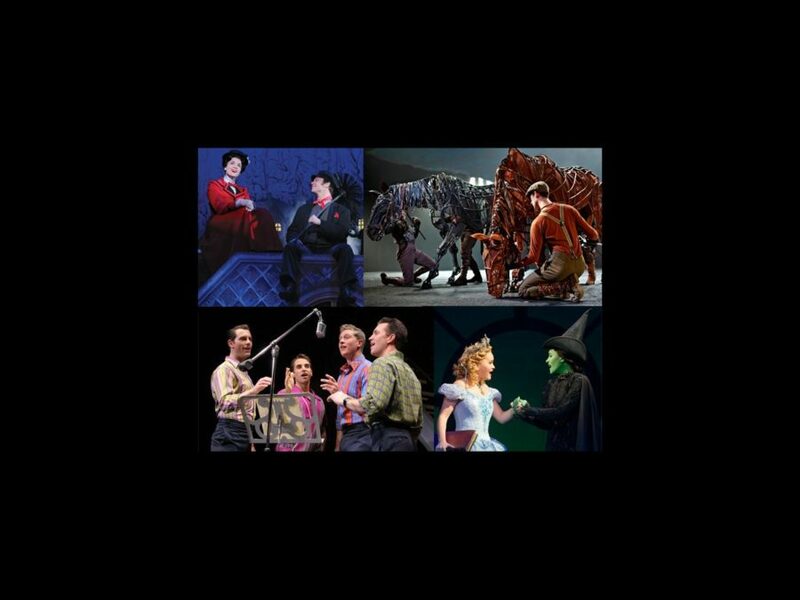 The Tony winner for Best Musical opens on December 11, 2012 and closes on December 23. The funky nuns of Sister Act will make their Boston debut from January 22, 2013 through February 3. The musical comedy (based on the hit film) focuses on disco diva Deloris Van Cartier, who witnesses a crime and goes into hiding in a convent. Under the suspicious watch of Mother Superior, Deloris helps her new “sisters” find their voices as she unexpectedly rediscovers her own. The Disney classic Mary Poppins will open on May 28, 2013 and close on June 2. It features songs from the hit film, including “A Spoonful of Sugar,” "Chim Chim Cher-ee” and “Step In Time,” as well as new numbers written specifically for the stage musical. Making its world premiere in Boston, the new musical Tuck Everlasting will play the Citi Performing Arts Center’s Colonial Theatre in June 2013, prior to making its Broadway bow. Based on the 1975 book by Natalie Babbitt, Tuck Everlasting tells the story of a young girl named Winnie Foster and her friendship with a boy named Jesse Tuck and his family, who become immortal after drinking from an enchanted spring. The new show will feature a book by Claudia Shear, a score by Chris Miller and Nathan Tysen and will be directed by Tony-winner Casey Nicholaw (The Book of Mormon).